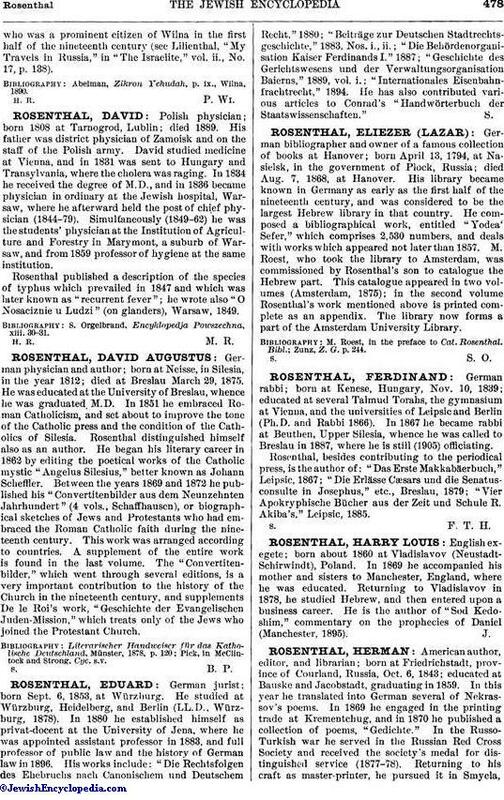 German bibliographer and owner of a famous collection of books at Hanover; born April 13, 1794, at Nasielsk, in the government of Plock, Russia; died Aug. 7, 1868, at Hanover. His library became known in Germany as early as the first half of the nineteenth century, and was considered to be the largest Hebrew library in that country. He composed a bibliographical work, entitled "Yodea' Sefer," which comprises 2,530 numbers, and deals with works which appeared not later than 1857. M. Roest, who took the library to Amsterdam, was commissioned by Rosenthal's son to catalogue the Hebrew part. This catalogue appeared in two volumes (Amsterdam, 1875); in the second volume Rosenthal's work mentioned above is printed complete as an appendix. The library now forms a part of the Amsterdam University Library. Zunz, Z. G. p. 244.